Sharron Mudloff can’t stand the sight of the abandoned homes that darken every block of the neighborhood where she’s lived for more than 65 years. It’s painful to see the crumbling, burned-out, vandalized structures that were once the homes of friends and neighbors she grew up with. To Mudloff, the ruins are a constant reminder that Gratiot Woods in East Detroit is no longer the vibrant neighborhood that was one of the first racially integrated areas of the city. Despite her sorrow for the empty homes around her, Mudloff doesn’t approve of the city’s long-term plan to raze them all. She believes many of these abandoned structures can still be saved to make her neighborhood viable again. “You don’t have to tear them down,” she says. Instead, she supports the work of a local redevelopment group that is helping to save houses before they wither. 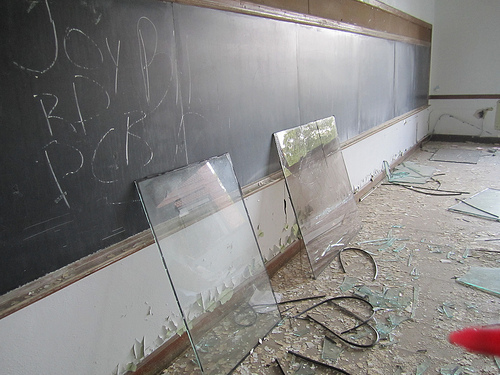 Over the past two decades, with the support of Gratiot Woods residents like Mudloff, the Detroit Catholic Pastoral Alliance is challenging the city’s long-standing approach to residential demolition. 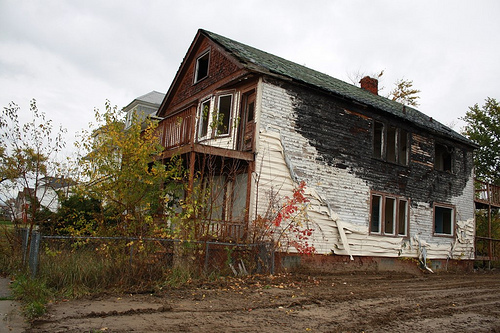 There are as many as 40,000 abandoned houses across Detroit’s 140 square miles and over the years mayor after mayor has created plans and made promises to demolish thousands of vacant structures during their administrations, but significant headway was never made. Now Detroit residents say they are seeing bulldozers as Mayor David Bing appears to be making slow but steady progress on his campaign promise to demolish 10,000 homes by 2013. The demolition plan is not without its critics. Residents and city council members are asking if Bing’s priorities should be on salvation rather then destruction. Neither the mayor’s office nor city agencies involved in demolition efforts returned repeated requests for comment. The problem, The Alliance says, is that demolitions are being performed on homes that could still be fixed up and sold. The nonprofit’s small staff operates out of an office that was once home to the Miami Vice Club, a crime ridden afterhours joint despised by the neighborhood. Since setting up shop in Gratiot Woods in 1994 the Alliance has created 100 new housing units through rehab and new construction. They’ve emphasized building the homes close together to create community and support a city-like aesthetic. They’re also constructing a new 45,000 square foot retail space on Gratiot Avenue and recently rehabbed a large long-abandoned mixed-use building that is now a bakery staffed by another non-profit that reintroduces people into the workforce after incarceration or time in treatment facilities. Bray says their approach is a more compassionate alternative to the Mayor’s plan. Walking down McClellan Street, Bray and Alliance Director of Community Development Cleophus Bradley say vacant houses need to be boarded up as soon as they go vacant to keep them from getting destroyed by vandals and squatters. They say if a property isn’t secured it will start to be broken into and stripped within weeks. It’s also cheaper than demolition. The directors said neighbors complain that when the city does demolish blighted properties, they leave behind vacant lots that aren’t maintained and can breed crime as well. Bray and Bradley say they board up the houses that the city is too slow to get to. Bray laughed when asked if they had to get permission from the city to secure homes. The men do see the occasional demolition in their community, about 10 in the last year, but they say it’s never announced and there will be two or three then nothing for months. While Gratiot Woods is just one neighborhood, residents like Mudloff, who beamed and clasped her hands together when she saw Bradley approach down the sidewalk, think the city has lost track of why there are still people left in Detroit at all. She lives in the house she grew up in, next to the building her family ran as a grocery store for 45 years. The store later became the home the first local office of the Alliance. Now it’s a barbershop, owned by another East Side resident, George Allen. She lives across the street from her church, Nativity of Our Lord Parish, which celebrated its 100th year last week. These things make the neighborhood home, she says. That’s why she stays. Those who work to save the buildings left of Gratiot Woods say they want the city to know that their neighborhood is not disposable. “We’re saying we’re staying here,” Mudloff said. The problem is those houses are worthless. It would take tens of thousands of dollars to rehab them and the median price of a house being sold in Detroit is around $7000. Detroit is bankrupt and simply can’t spend the money on hopeless causes.